How many women have been in congress? The Pew article, A record number of women will be serving in the new Congress by Drew Desliver (12/18/18) provides an historical overview and the chart copied here of women in congress. 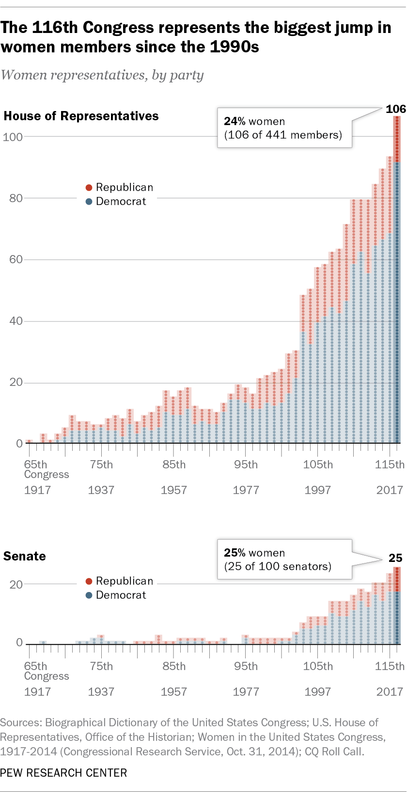 When the 116th Congress convenes next month, women will make up nearly a quarter of its voting membership – the highest percentage in U.S. history, and a considerable increase from where things stood not too long ago. A record 102 women will serve in the incoming House of Representatives, comprising 23.4% of the chamber’s voting members. More than a third of those women (35) won their seats for the first time in last month’s midterms. The differences by party are notable. For instance, the most Republican women in the House of Representative was 25 in 2017-2019 and down to 13 this year. On the other hand, there have been more than 25 Democrat women in the House since the 1993-1995 congress. As a percentage of each party’s delegation, women have never exceeded more than 10% of Republican House members. From 109th through 112th congress (2005-2013) women made up 9.9% of Republican House members. This is down to 6.5% (13 women) this year. On the other hand, women have been generally increasing as a percentage of Democrat House members since the 101st congress (1989-1991) and stand at 38% (89 women) this year. Wikipedia posts this data in a table, which comes from a Congressional Research Service report. Thanks to all the visitors of sustainabilitymath.org. Have a Happy New Year! In 2019 the goal is to continue to post sources of graph and data while adding some of our own interactive graphs to the site. What are the top charts of 2018? EPI puts forth its top twelve charts of 2018 in the post Top charts of 2018 Twelve charts that show how policy could reduce inequality—but is making it worse instead (12/20/2018). For example, chart 10 (copied here) compares 11 economic and social indicators between white and African american families from 1968 to 2018. Not nearly far enough. The chart shows that, while African Americans are in many ways better off in absolute terms than they were in 1968, they are still disadvantaged in important ways relative to whites. African Americans today are much better educated than they were in 1968—but young African Americans are still half as likely as young whites to have a college degree. Black college graduation rates have doubled—but black workers still earn only 82.5 cents for every dollar earned by white workers. And—as consequences of decades of discrimination—African American families continue to lag far behind white families in homeownership rates and household wealth. The data reinforce that our nation still has a long way to go in a quest for economic and racial justice. There are 11 other economic related charts. Each chart has a link to data and can be downloaded. Are babies born uniformly throughout the year? The graph here is produced from data made available at the Conversation article ‘Tis the season for conception by Micaela Martinez and Kevin M. Bakker (12/19/18). Is there a pattern that is similar for both New York and Texas? It sure seems like it. It turns out reproduction is seasonal across all living organisms, from plants, to insects, to reptiles, to birds and mammals – including human beings. The ultimate explanation for this phenomenon is an evolutionary one. Earth’s environment is seasonal. Above or below the equator, the year is structured by the winter, spring, summer and fall. In equatorial regions, the wet and dry seasons punctuate the year. Organisms have evolved strategies to reproduce at the time of year that will maximize their lifetime reproductive success. Humans are no exception and maintain this evolutionary outcome: birth seasonality. Researchers, including us, have recently been working to understand more about why births are seasonal because these patterns can have a big impact on childhood disease outbreaks. The article has another graph, also with data. The R-script and csv file for the graph here. Clinker is responsible for how much of CO2 emissions? In 2016 clinker contributed almost 2 billion tonnes of CO2, about 7% of the world total. What is clinker? The BBC article Climate change: The massive CO2 emitter you may not know about by Lucy Rodgers (12/17018) provides the answer. In short, clinker is the key ingredient in cement and the world produces a lot of cement (see graph). Cement is the source of about 8% of the world’s carbon dioxide (CO2) emissions,according to think tank Chatham House. If the cement industry were a country, it would be the third largest emitter in the world – behind China and the US. It contributes more CO2 than aviation fuel (2.5%) and is not far behind the global agriculture business (12%). Clinker accounts for about 90% of the CO2 emissions related to concrete and so 90% of the 8% of world CO2 from cement is due to clinker. Historical data for world cement production can be found on the USGS page Historical Statistics for Mineral and Material Commodities in the United States. For the last couple of years see the Cement Statistics can Information page. 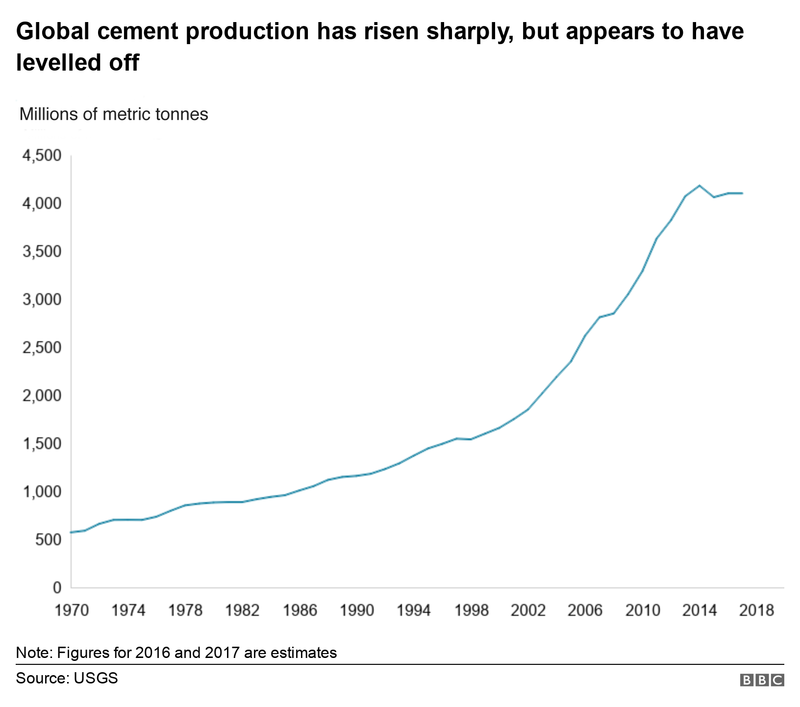 The BBC article has another a couple of other nice graphs and a diagram with an explanation of how cement is made. 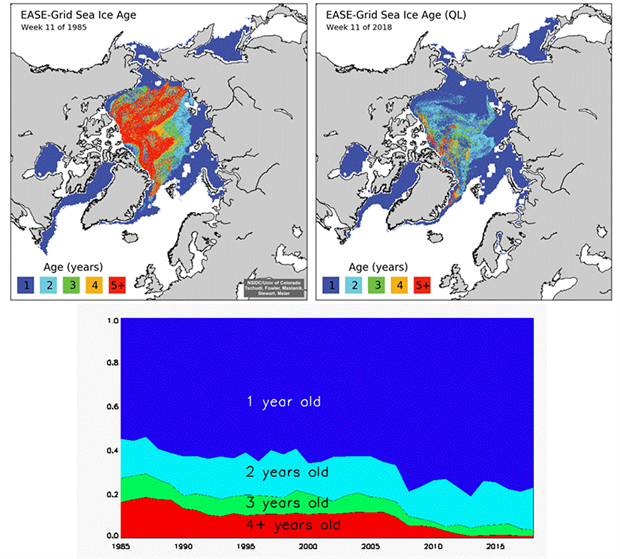 Follow Up: How old is Arctic Ice? In 1985, the new NOAA report found, 16 percent of the Arctic was covered by the very oldest ice, more than four years old, at the height of winter. But by March, that number had dropped to under 1 percent. That’s a 95 percent decline. There is a well-known feedback loop in the Arctic, caused by the reflectivity of ice and the darkness of the ocean. When the Arctic Ocean is covered by lighter, white ice, it reflects more sunlight back to space. But when there is less ice, more heat gets absorbed by the darker ocean — warming the planet further. That warmer ocean then inhibits the growth of future ice, which is why the process feeds upon itself. Because of this, Arctic sea ice loss has already increased the warming of the planet as a whole. Ramanathan said the impact is equivalent to the warming effect of 250 billion tons of carbon dioxide emissions, or about six years of global emissions. Ramanathan fears that entirely ice-free summers, if they began to occur regularly, could add another half- degree Celsius (0.9 degrees Fahrenheit) of warming on top of whatever else the planet has experienced by that time. The Washington Post article has a few nice animated graphics. The graph and map here is from the sea ice sections of the Arctic Report Card: Update for 2018 – Effects of persistent Arctic warming continue to mount from NOAA. The Arctic Report card contains a half dozen charts and graphs including one that compares March and September sea ice extent. A data and project for this is in our Statistics Project page. Which country emits the most CO2? The country that emits the most CO2 depends on how it is measured. 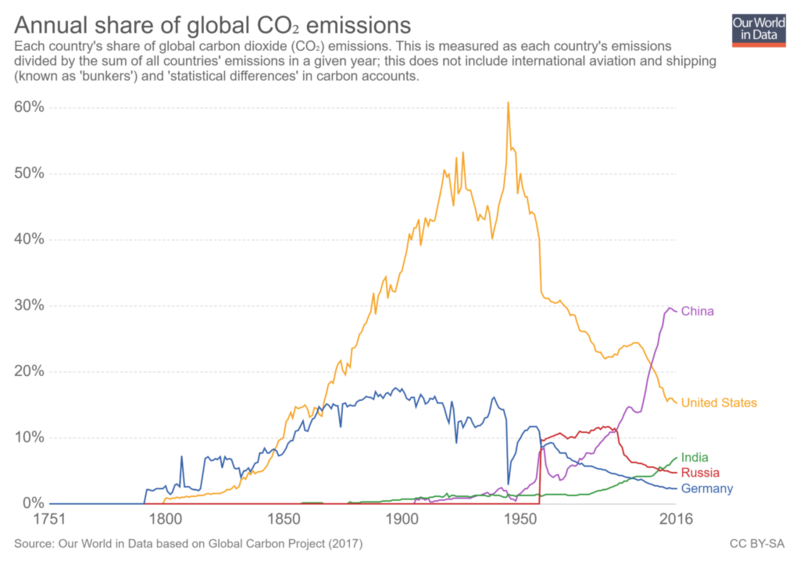 Our World in Data has a graph of annual share of CO2 emissions by country. By this measurement, a graph with the top 5 countries (China, U.S., India, Russia, & Germany) in 2016 was downloaded from Our World in Data. In this case, China has been the largest contributor of CO2 since 2005. In fact, in 2016 China emitted 10,295 million metric tons of CO2 compared to 5,240 million metric tons by the U.S. On the other hand, from EIA data, in 2016 each person in China emitted 7.3 tons of CO2 compared to a person in the U.S. at 16.2 tons. The EIA data dates back to 1980, and from 1980 to 2106 China emitted 177,547 million metric tones of CO2 compared to 197,176 for the U.S. Which is more important, per person, current, or total historical emissions? How does this create challenges in climate talks? Further analysis with other countries can be done with EIA data. Data can also be downloaded from the Our World in Data post. The Calculus Projects page has an example of using this data in a calculus class. How fast is runoff from Greenland ice sheet increasing? 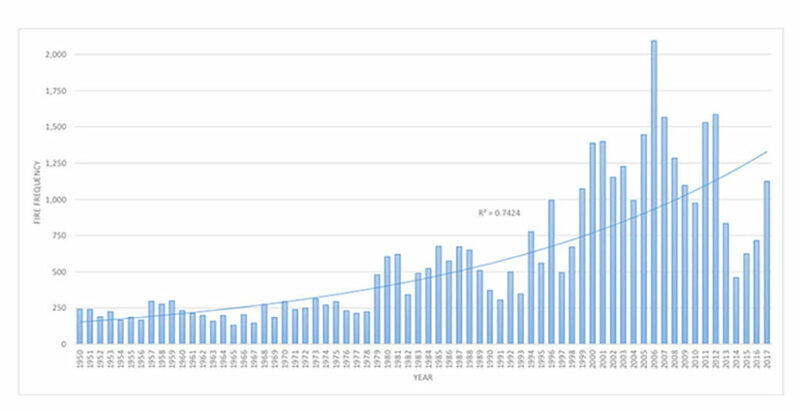 We show that an exceptional rise in runoff has occurred over the last two decades, equating to an approximately 50% increase in GrIS-integrated runoff compared to pre-industrial runoff, and a 33% increase over the twentieth century alone. The Woods Hole Oceanographic Institution (WHOI) provides a less technical summary of the paper in their post Greenland Ice Sheet Melt ‘Off the Charts’ Compared With Past Four Centuries (12/5/18). Ice loss from Greenland is one of the key drivers of global sea level rise. Icebergs calving into the ocean from the edge of glaciers represent one component of water re-entering the ocean and raising sea levels. But more than half of the ice-sheet water entering the ocean comes from runoff from melted snow and glacial ice atop the ice sheet. The study suggests that if Greenland ice sheet melting continues at “unprecedented rates”—which the researchers attribute to warmer summers—it could accelerate the already fast pace of sea level rise. The WHOI post includes a short video with a graph similar to the one copied here and a summary of the science. The Nature article has data available. An international team of researchers, including a NASA glaciologist, has discovered a large meteorite impact crater hiding beneath more than a half-mile of ice in northwest Greenland. The crater — the first of any size found under the Greenland ice sheet — is one of the 25 largest impact craters on Earth, measuring roughly 1,000 feet deep and more than 19 miles in diameter, an area slightly larger than that inside Washington’s Capital Beltway. 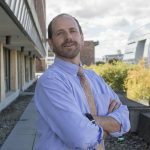 The NASA article includes a short video. More than half the U.S. population lives in what percent of counties? The answer is the title of the Census Bureau post More Than Half of U.S. Population in 4.6 Percent of Counties by Haya el Nasser (10/24/18). The map copied here shows the counties. 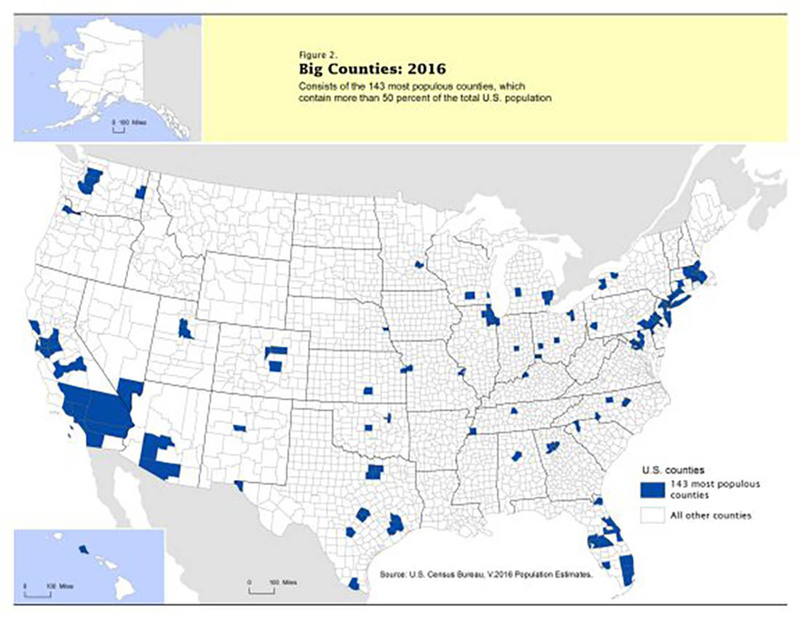 At the county level, the geographic distribution of the estimated 325.2 million people in the United States clearly distinguishes two main areas where people live: “big” counties and “small” counties. More than half of all residents live in just 143 big counties (in terms of the number of residents), according to an analysis of U.S. Census Bureau county estimates. That means less than half of the population is spread out across the remaining 2,999 small counties. The post has a short video with more information. For instance the average population density of big counties is 926 people per square mile and only 48 people per square mile for small counties. Small counties are almost 75% non-Hispanic white, while big counties are under 50% non-Hispanic white. There is also a notable difference in the rate of growth. “Big-county America is growing nearly twice as fast as small-county America,” Sink said. “They’re not only getting bigger but increasingly more diverse.” Thus, if current trends continue, it’s likely that the divide between big and small will continue to become more pronounced in the future. The post has another map and some useful tables which include the distribution of small and large counties.